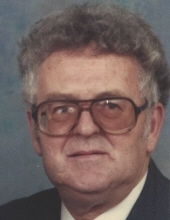 Dale F. Egbert, 83, of Fostoria, passed away at 8:45 pm Sunday November 4, 2018 at Good Shepherd Home, Fostoria. He was born June 2, 1935 in Republic to the late Courtney and Inez (Sours) Egbert. He married Norma L. Kehres on November 5, 1960 in Fostoria and she survives in Fostoria. Also surviving are three children, Gina Stiger, Fostoria, Kathy DeMuth, Findlay and Michael (Susan) Egbert, Fostoria; seven grandchildren, Kristina (Brent) Nye, Stephanie Layer, Jyll (Brian) Chase, Brandon (Alyson) Egbert, Brittany (Jordon Fox) Egbert, Ashley DeMuth and Andy DeMuth; sisters, Rosie Rhoad, Bloomville and Mardella Wellston, New Jersey. Dale retired from Foodtown, Fostoria and had served in the US Army. Visitation is Thursday November 8, 2018 from 4-7 pm at HOENING & SON FUNERAL HOME 133 W. Tiffin Street, Fostoria. Funeral services will take place at 11:00 am Friday at the funeral home with Pastor Jerry Copeland presiding. A luncheon will follow the service in the funeral home, with committal services taking place at 1:30 pm at the chapel of Seneca Memory Gardens, Tiffin. Memorials are suggested to the “Residents Activity Fund” of Good Shepherd Home. To send flowers or a remembrance gift to the family of Dale F. Egbert, please visit our Tribute Store. "Email Address" would like to share the life celebration of Dale F. Egbert. Click on the "link" to go to share a favorite memory or leave a condolence message for the family.